>i am so, so stupid. 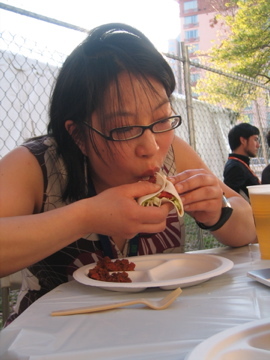 because of my naivete and seeming bravado, i ate the nuclear taco. 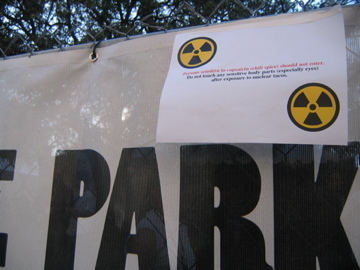 because i ate the nuclear taco, approximately 90 min later i vomited on east 6th & brazos. because i vomited, my stomach feels like it’s being burned alive by an army of trogdors. because my stomach feels burninated, i’m back at the apartment trying not to die while literally twelve parties are being set in motion in downtown austin. by the way, this is not the first time i’ve gotten sick while eating something superspicy. i love love LOVE spicy food; i adore it, i crave it. but only certain peppers–namely the dried roasted red ones in chinese dishes and hyper-potent scotch bonnet oil–seriously irritate my stomach lining to a most tummy-clutching discomfort. for most people, the pain is on the tongue. i almost think for me it’s a chemical allergy to something in the pepper production or preparation. in any case, you would think i’d know better, right? 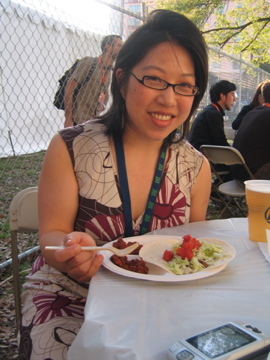 here’s the story: apparently ‘nuclear tacos’ is a sxsw tradition, where they set up a bbq party + tent outside boasting the hottest tacos in the world. lest you think i’m nuts, there were actually a lot of people there! 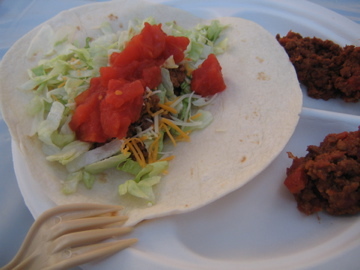 you had your choice of hard corn taco shells or soft flour tortillas; the potent fillings of nuclear beef, hot beef, nuclear veggie (more like beef-esque soy-protein product), or hot veggie; and toppings of cheese, lettuce, tomatoes, and sour cream. as we waited in line, we saw many a pink-faced diner exit the premises, sweating, crying, swearing. i pooh-poohed them as total wimps. naturally. 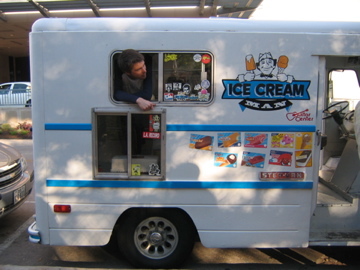 here’s the cutie indie ice-cream truck right outside the premises, apparently to salvage burnt esophaguses. one guy literally ran from the bbq, yelling, ‘need, ice-cream, NOW!’ he looked pretty desperate for a creamsicle or something. the oh-so-welcoming sign at the entrance. i wonder if they put the signage there to sustain the campiness of it all, or if they were legally contracted to do so. you have to wonder. i love the composition of this pic. these guys are bravely concocting the killer taco innards. out of the frame is another mellow dude putting on some rubber gloves. by the way, the air is full of the hot, spicy smoke. just hanging around the tent, you can feel it already tickling the back of your throat. you probably dont want to get too close, buddy. so here is my lovely dinner, before the devouring. the flour tortilla holds the nuclear beef, and the other dollops are the nuclear and hot veggie just for curious sampling. by the way, the weather could not have been more perfect! thankfully the thunderstorms from last night gave way to delightful sunshine early this morning. chowin’ down. it was definitely high on the spicy scale, but it wasn’t tastebud suicide. i figured i’d condense the time spent in burning pain so i sort of gnarfed it down fairly quickly. pretty tasty, you could still taste the beef, but i do confess to blushing, sweating, and blowing my nose at copious frequency. however, i felt pretty darn good next to a woman who took two bites of her hot beef taco and declared defeat. ha, i thought, see, i am someone who can take it! as always, my competitive spirit persists, even when it comes to inflicting gastrointestinal pain on oneself, as it (later) became painfully clear. and you, dear reader. that is it. that all i have as comfort for 11pm on a monday. p.s. pix on flickr. tagged with nucleartacos. it’s the truth. >as long as you hid your distress until leaving the premises i still think that victory was yours. 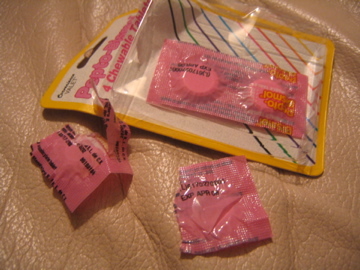 who knew that the sweet taste of it was identical to stomach acid? yum. >I think you won too. I’m sure I wouldn’t have lasted a second! >If there are other kinds of peppers you know don’t make you ill I’d love to make up a batch with those the next time we do NTN at my house. 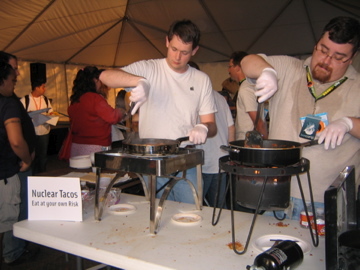 (Keep an eye on http://nucleartacos.com; there’s usually 1-2 days notice of a night, which is normally the 1st Wed. of the month)If you were there early enough, the tacos would have had red savina powder, otherwise it would have been the ‘mash’. Both came from http://redsavina.com/. When making them at home I use the powder, along with a mix of fresh habeneros and seranos for flavor. Though lately I’ve been using Naga Dorsets instead of the red savina.Also, I couldn’t tell how much meat you had on the taco, but most folks go sparingly with it. Sour cream is definitely your friend. 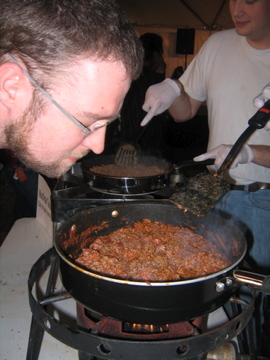 :)I’m really glad you liked the taste, though… I pride myself in making the tacos both super-spice *and* good tasting. I wasn’t doing any cooking Monday, but I guess that just means that moonwick, dario, _fool and fish (and anyone else who cooked that I don’t know about) did a good job.